John Peterson was born April 30, 1877 in Gällersta Parish, Örebro Län, Sweden to Eric and Augusta Pettersson. John was the youngest of three children and curiously not given a middle name. John joined his sister Alma (coincidentally, Charlie also had a sister named Alma) and brother Svante. John’s father Eric was a master blacksmith. Unquestionably, John learned a great deal from time spent in his father’s shop. Sweden has long been known as a source of premier metal and metal workers. A region where smiths understood advanced techniques in forging and alloy development. Old Swedish iron made the news in 2013, when the largest cannon recovered from pirate Blackbeard’s ship, The Queen Anne’s Revenge, was tentatively identified as a Swedish cannon. During this time period, Swedish blacksmiths seemed to have the special knowledge on constructing cannons of iron hardy enough to withstand the extreme pressures of the big guns. The road to America was paved by Svante. John’s brother immigrated to America in April of 1887 but returned in April of 1889. One can only imagine what stories, good and bad, he told John about his adventures. In another interesting twist, when he returned to Sweden his name was recorded as “Svante (Pettersson) Smith”. In September of 1891, Svante yet again traveled to America. Four years later, Svante came home to Sweden, but with a surprise – his two year old son, Eric Johan Smith. For some inexplicable reason, he left little Eric with his parents and returned to America, this time with brother John (October 1895). John also adopted the surname of “Smith”, but must have abandoned it shortly after arrival. John and Svante crossed the Atlantic on the White Star Lines Teutonic and arrived in New York on October 23, 1895. Family tradition states John went on to Minnesota, working as a blacksmith and mechanic. He eventually traveled to Mitchell, South Dakota, where he met the young school teacher, Jessie B. Sandidge. John and Jessie married around 1908 in South Dakota. In 1909, John & Jessie traveled through Iowa and Kansas en-route to Canon City, Colorado where they had an orchard. During the trip, they stopped in Red Oak, Iowa and visited a factory, and he wrote about the experience to his brother. In the letter, John tells his brother he intends to travel further west, possibly to Oregon. In late 1909 or early 1910, John & Jessie arrived in Roseberry, Idaho and purchased a farm. Roseberry was booming, the predominant community in the high mountain valley it shares with McCall, Idaho, about 12 miles north. The valley is about 5,000 feet in elevation, long and broad surrounded by mountains and blessed with several large lakes, Payette Lake at McCall being the largest. Postcard beautiful, the area has long been considered a premier summer and winter recreation area by the residents of Boise, 100 miles to the south. Although the winters are beautiful, they can be brutal, with deep snow and cold temperatures. McCall boasts the deepest snowfall totals of any city in Idaho with an average of 174 inches a year. Roseberry contained all the essentials of a small metropolis and even some excess; two blacksmith shops, two general stores, a beautiful five sided two-story motel, a flour mill, saw mill, schools, restaurant, butcher shop and creamery. In 1914 the Pacific, Idaho and Northern Railroad line was finally constructed connecting McCall and Payette Lake to Boise. The rail line was laid one and a half miles to the west of Roseberry and effectively killed the thriving town. Many Roseberry buildings were moved to the rail line and the existing town of Donnelly sprouted to life on the ashes of Roseberry’s demise. Jessie’s mother, Clara Sandidge and her other daughters, Rita and Gladys, lived with John and Jessie at the Roseberry farm for a time. Jessie’s father, James, had died in 1902, leaving Clara and her daughters in difficult circumstances. Also joining the family was John Harold, born in McCall to John and Jessie on August 5, 1911. Dorothy joined the family in 1918. The last child, James Merrill was born in 1922 in Lebanon, Oregon. Another reason John and Jessie settled in the McCall area was the fact that Jessie’s sister Stella and her husband, Ben T. Johnson had established themselves there. Stella and Ben so entrenched themselves in the McCall area they lived there most of their lives, raising their very large family in the area (eleven children). Stella died in McCall in 1966. At the time John purchased the Roseberry farm, he also bought a blacksmith shop in McCall and Jessie began working in McCall as a schoolteacher. Eventually Jessie was named Superintendent of Schools for the fledgling Valley County (Valley County was formed in 1917). Many long days must have been spent traveling by horse, back and forth between the farm and the shop (8-12 miles each direction). With the deep snowfall and cold nights in the winter, it’s reasonable to assume some nights were spent at the shop. Between 1912 and 1919, John sold the farm and the family began living at the shop in McCall. While in McCall, John and Jessie were among the founders of the Community Church, which began in 1912. The church is now known as the First Congregational Church. 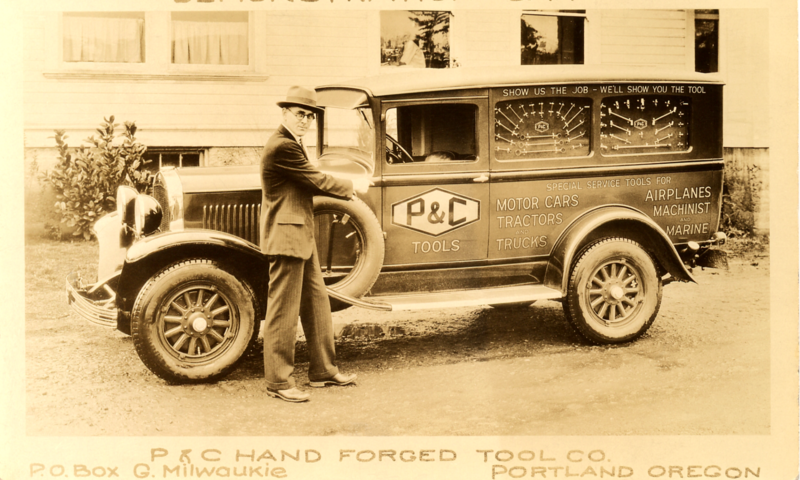 John sold P&C Tools in 1941 to the Plomb Tool Company. He was 64 years of age and expected to slow down and retire. Instead, he purchased several buildings in Garthwick (suburb of Portland, Oregon) on S.E. Milwaukie Avenue, one of which was a hardware store. 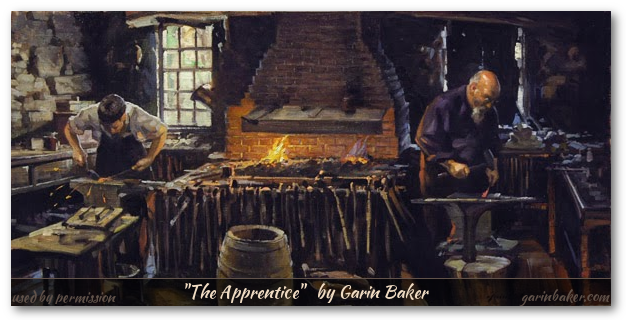 Unable to free himself from the forge, he began making gardening tools such as hand trowels, weeding tools, etc., which he sold from the hardware store. His garden tool business was called, “Peterson Tool Mfg Co.”. John continued to fashion iron into usable tools until his death, January 12, 1952. Jessie rented the hardware store building for income and passed away November 28, 1962. John and Jessie’s story is incomplete without mentioning their strong faith in God and moral character. John and Jessie were active members of the Sellwood Baptist Church for years preceding their deaths. Their children were active in youth activities at the church, with their youngest son James Merrill meeting his future wife Melba through inter-church youth activities in the area.